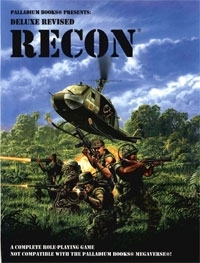 RECON is set in a fictional world that parallels that of 20th Century Earth and focuses on the realistic military combat of the Vietnam era. Hard hitting military action, guerilla warfare and treachery. Gritty and realistic. A complete role-playing game that's easy to learn. Quick, easy character creation rules - make a character in under 10 minutes. Weapons and vehicles of war. World information, maps and background. Over a dozen adventures and adventure ideas. RECON is not compatible with other Palladium RPGs.